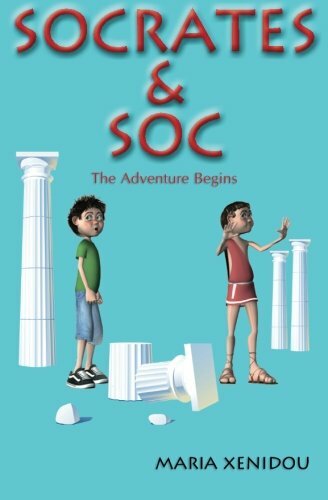 A witty, breathtaking, and educational adventure, Socrates &amp; Soc takes a look into the past and present through the eyes of two ten-year-old boys who trade places with the help of an ancient piece of marble with magical properties. The duo may be from different centuries, 460 BC and 2004 AD, but by chance they share the same name and hail from the same city in Greece, and what's more, one of the boys happens to be the ancient philosopher Socrates. What happens to him in 2004? As a boy, he implements his philosophical ideas as a way of life, and author Maria Xenidou portrays him as shrewd, intelligent, and wise. Employing the dialectic method, he continually poses questions to invoke people into thinking about situations and issues, and after deduction, their own conclusions are exactly what the boy said in the first place. Some things just don't make any sense to him, but there's nothing complicated about one of the greatest minds experiencing for the first time fizzy drinks and burping! What happens to Soc in 460 B.C.? Witnessing the ancient Olympic Games, he has a chance to explore the ancient world, which he discovers is surprisingly liberal and advanced in ways he never expected. Without TV and Wii, Soc has a hard time adjusting to a life full of physical activities and mishaps. He learns to appreciate real things and gradually becomes addicted to a more natural way of life. A mystical and compelling story for ages nine to eighteen, the book is peppered with humor, steeped in ancient Greek philosophy, and guaranteed to equally amuse and amaze older readers. Born in 1953 on Christmas day in Nicosia, Cyprus, Maria Xenidou is deeply interested in psychology and has always found pleasure in painting, playing music, and writing. She was the artist in her family, and her friends and family describe her as a highly creative, amusing, and sensitive person. With a successful professional background in the field of nutrition and cosmetology, Xenidou has never given up on her inner calling. Her inherent communication skills and her great love of children inspired her to write Socrates &amp; Soc. She strives to share the knowledge she acquired and the experience she gained over the years as a mother, and more recently as a grandmother, through her books.